CarGurus has 86,446 nationwide Equinox listings starting at $800. The 2015 Chevrolet Equinox is a capable—if aging—popular crossover that trades some features for versatility and brute-force simplicity. 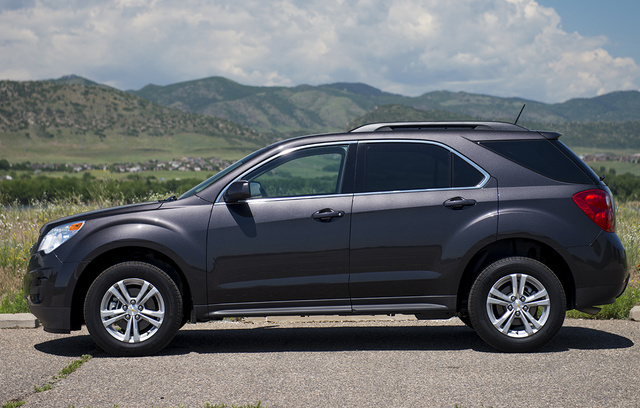 The 2015 Chevrolet Equinox is a popular family crossover due to its tried-and-true approach to family life. Its quiet exterior and wide range of configurations can be adapted to myriad circumstances, which is probably why Chevrolet sold nearly 250,000 last year. Compared to its rivals, it falls short in features and fuel economy, with smaller—but still usable—cargo capacity. The Chevrolet Equinox is General Motors’ Leatherman tool for families. The spacious, but compact, crossover covers a lot of ground in powertrain configuration and utility. The 5-passenger crossover comes in front- or all-wheel-drive spec with 4- or 6-cylinder motivation up front. Inside, the plain cloth seats that can soak up ground-in Cheerios can be replaced with leather in higher-level trims of the Equinox—it’s up to your need. Dressed up, the Equinox wouldn’t be ashamed in valet lots; dressed down, it would be equally at home at Big Lots. The biggest encumbrance for the crossover may be its looks—the Equinox is exciting like FM soft rock. Its exterior looks are timid and continuously smooth, but certainly won’t offend anyone. Our weeklong tester was clad in gray—a color Chevrolet calls Silver Ice Metallic—that smothered the crossover’s features in a long, continuous haze. More exciting hues, such as Crystal Red, are available, but they not only require more money for the paint, but also more money for higher trim levels. Base Equinox buyers can’t choose from more than 4 colors even if they have the money to do so. Starting with the base L, standard features include the 2.4-liter engine, a 6-speed automatic transmission, Bluetooth phone, Wi-Fi hotspot capabilities (a feature added for 2015), and 60/40-split folding rear seats. The LS trim represents the next step and adds satellite radio with a 3-month trial subscription and a few body-colored panels to the exterior. The 1LT package adds a few more creature comforts, such as a 7-inch touchscreen MyLink radio, backup camera, leather-wrapped steering wheel, and available 18-inch wheels. The 2LT package adds heated front seats, a premium stereo, automatic climate control, and optional leather and navigation. The top-of-the-line LTZ trim adds rear park assist, forward-collision alert, lane-departure warning, halogen headlamps, a power rear liftgate, and optional 19-inch wheels, leather seats, and rear-seat entertainment. The LT and LTZ trims can both have a V6 stuffed under the hood. The Equinox isn’t a one-size-fits-all crossover. The wide-ranging powerplant can swing from a paltry front-wheel-drive 4-cylinder all the way up to a tow-rated all-wheel-drive six, with every stop in between. The base option is a 2.4-liter 4-cylinder that produces 182 hp and 172 lb-ft of torque to prudently power the Equinox. Mileage returns can reach—but not realistically exceed—30 mpg in front-wheel-drive (FWD) highway cruising. The 2.4-liter is rated by the EPA at 22 mpg city/32 highway, with a 10 percent reduction in all-wheel-drive (AWD) getup. The smaller mill can be optioned to run on E85 Flex Fuel with a further drop in fuel economy. The optional 3.6-liter V6 churns 301 hp and 272 lb-ft of twist, at a cost of a 20 percent loss in fuel economy. The 3.6-liter option is best for towing or a serious mountain climb in the winter, and it's rated to tow up to 3,500 pounds. Its mileage takes a considerable hit from the smaller mill: The 3.6 manages 17/24 according to the EPA, with 10 percent shaved off that for AWD. Both versions of the Equinox feel aptly powered, but not clobbering. Predictably, moving the 3,700-pound mass with a four pot before you pile it with children and gear isn’t going to be overwhelming, but surprisingly, the bigger engine feels roughly the same way. Both engines don’t seem rushed to get anywhere, and despite having 50 percent more cylinders, even the V6 takes a little girding to manage a mountain pass. Around town, the 4-cylinder would have distinct fuel-economy advantages over the V6, but buyers who anticipate a lot of highway driving should seriously consider springing for the V6. Not having to peg the right pedal everywhere could return fuel economy savings later. The Equinox makes hay in its utility, and perhaps that’s why the Equinox sells tens of thousands of examples each month. Despite having a mildly cluttered instrument panel, the Equinox is straightforward and easy to understand. 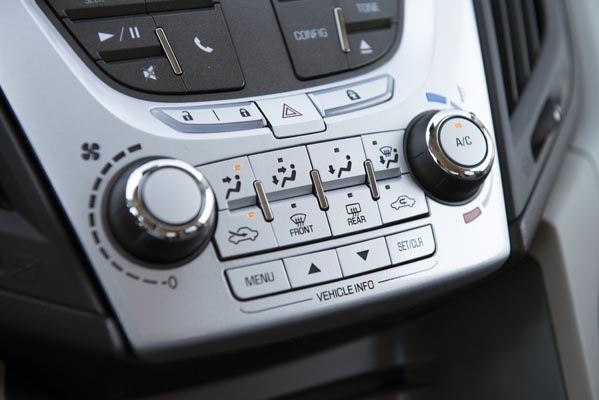 The climate controls and infotainment controls are simple and easy to use. Pairing a Bluetooth phone is quick and painless, which is helpful for a family car with rotating drivers and passengers. With the seats up, the Equinox hauls 31.5 cubic feet of cargo, and with the rear seats folded, it hauls 67.3 cubic feet. It’s not as spacious as the Ford Escape, Toyota RAV4, or Nissan Rogue, but it’s plenty for a weekend trip to a furniture or home-improvement store. The Equinox’s presence is wonderfully non-existent on road trips, and the interior is polite and unobtrusive. Little road noise comes through to the cabin, and it settles into a highway routine without being nervous or fidgety. That translates into a steering feel that isn’t exactly on point, but as an around-town hauler or long-legged cruiser, a generous on-center feel isn’t the worst thing in the world. 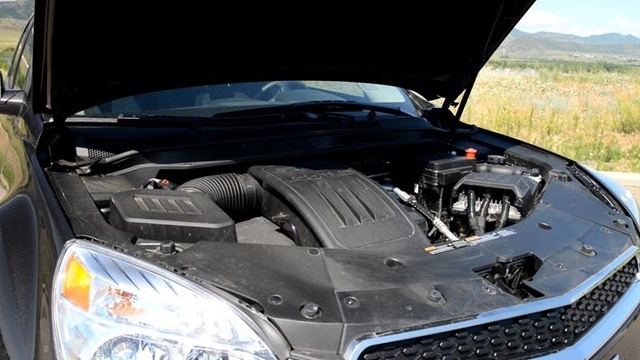 When you’re pressing the engine for all the power it has, the Equinox responds with a strenuous engine sound, even if the car isn’t all that hurried to get where it needs to go. Future models may benefit from a diet considering the Equinox’s nearly 5,000-pound heft, which may go a long way in improving steering feel and real-world fuel economy. Nonetheless, the Equinox is a solid pick for an unobtrusive car that can fade into the background of daily duty. 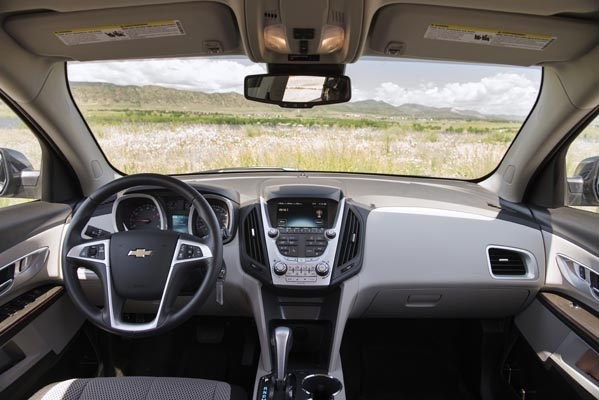 The Equinox benefits from Chevrolet’s unfussy approach to tech and storage. Cubbies abound, and there’s enough room to stow gadgets and gear in the glove box, center console, and door compartments. The interior of our tester was shod in gray cloth, which didn’t feel particularly upscale, but did feel rugged enough to handle the day-in, day-out rigor of family life. Chevrolet’s MyLink system works well with smartphones and enables Bluetooth streaming with Pandora and Stitcher capabilities. It won’t blow buyers away with customization options, gee-whiz technology, or a large touchscreen, but it is reliable. There are a few times the system doesn’t recognize commands, and punching in an address can be frustratingly slow, but GM’s available OnStar system (subscription required) can pick up where the user interface falls off. For 2015 and presumably beyond, GM is equipping the Equinox with 4G/LTE hotspot capability that turns the Equinox into a roaming Internet hub. The first 3 months of data (or 3GB) is included with the vehicle purchase, and a subscription plan with OnStar is required thereafter. Subscription plans start at $25 per month for basic service, with 200MB of data, which isn’t much. A more realistic plan for browsing and some streaming runs about $50 a month. For families who use a lot of data, the higher plans are more realistic if that fits within their budgets. The center console can feel a little cluttered with a mass of buttons underneath the touchscreen, but the controls are easy to pick up and understand, and they are better presented than those in some luxury autos. Higher trims, such as the LTZ, can be fitted with dual rear-screen entertainment systems. The cargo area in the Equinox isn’t as large as that in some of its competitors, such as the Honda CR-V or Mazda CX-5, but its load height and rear opening make loading the back relatively easy. The Chevrolet Equinox received a 4-star overall safety rating from the National Highway Traffic Safety Administration, including a 5-star rating for side impact crashes and 4 stars for front and rollover crashes. 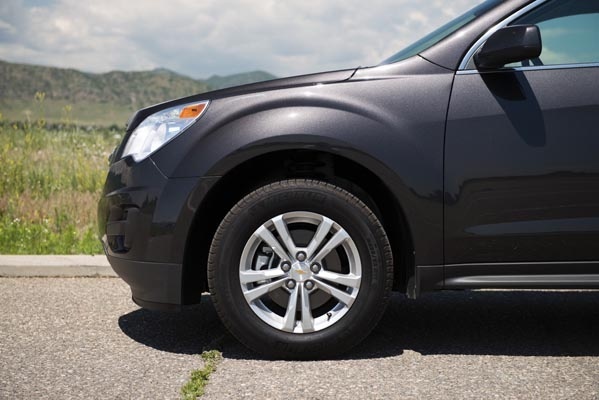 Similarly, the Insurance Institute for Highway Safety gave the Equinox a Good rating in all categories—small and moderate overlap front, side, roof strength, and head restraints and seats. Outward visibility is very good in the Equinox, and its higher hip point offers an excellent view of the road ahead. The Equinox also features rear child-seat latches and easy ingress and egress for loading and unloading in the front and rear seats. The Equinox comes standard in higher 2LT and LTZ trims with higher-tech safety features including frontal-collision alert, lane-departure warnings, and parking sensors. Every trim, except for the base L, comes with rear-facing parking cameras. The Equinox comes standard with 4-wheel antilock brakes, tire pressure monitoring, daytime running lamps, driver and passenger airbags with side-impact bags, and head curtains up front. The Chevrolet Equinox is an aging crossover on an older platform that will be replaced in coming years. That model should be smaller to make way for a new midsize crossover for Chevrolet based on the Traverse. The Equinox represents a solid pick for most families based on its versatility and availability. There are newer crossovers in the segment that offer additional cargo room and functionality, but the Equinox stays in the middle of the road for many buyers looking for a relatively compact package available in a wide range of prices. Users have reported difficulty achieving mileage estimates based on EPA ratings, especially with the 2.4-liter 4-cylinder, especially considering its limited power. J.D. Power and Associates rated the car a 4 out of 5 in initial quality, with a 5 rating in mechanical reliability. Body and interior quality were the chief concern for the research group, which gave the Equinox a 3 out of 5 rating. 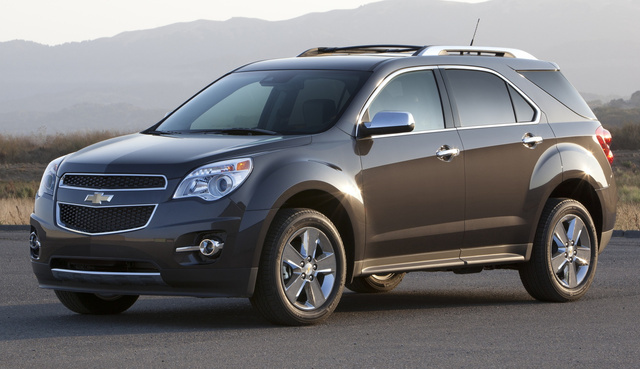 What's your take on the 2015 Chevrolet Equinox? 4909rwc I am happy with the LTZ model I just bought, but am having difficulty entering my current location in the Navigation system. Can someone tell me??? RCM321 I am also having problems with the Nav system on my 2015 Equinox w/ 00730 miles. System shows the constant vehicle's location to be at the GM Tech Center in Warren, MI regardless of its present location, which is the Dayton, OH area. Local Dealer is working with Chevrolet Tech Assistance trying to diagnose the problem & it appears they are replacing individual components one at a time...hoping that will correct the problem. TheHorror Donald, why are you even considering an Equinox? 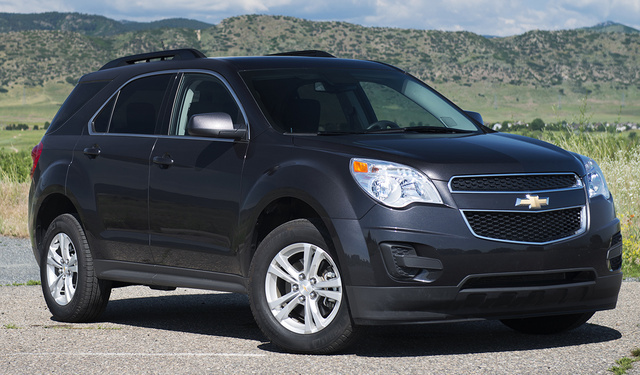 Users ranked 2015 Chevrolet Equinox against other cars which they drove/owned. Each ranking was based on 9 categories. Here is the summary of top rankings. 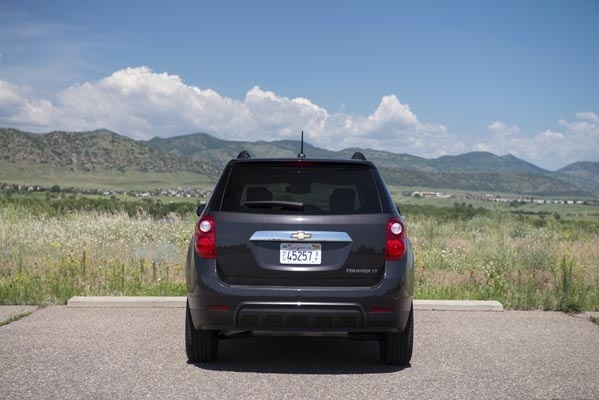 Have you driven a 2015 Chevrolet Equinox?